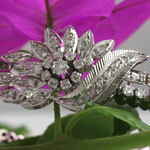 Estate, vintage and antique bracelets. 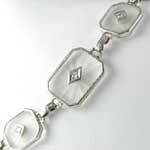 1920s Art Deco etched crystal diamond 14kt white gold filigree link bracelet. 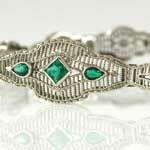 Art Deco filigree bracelet with emerald embellishments 14kt (585) white gold. 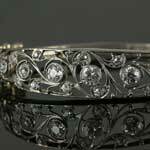 A brilliant antique Art Deco diamond white gold bracelet with modern floral design (3.48 ct tw diamonds). 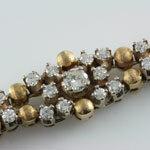 This estate gold and diamond bracelet has approximately 0.86 ct tw of diamonds (0.86 ct tw, VS1-SI2, H-I).